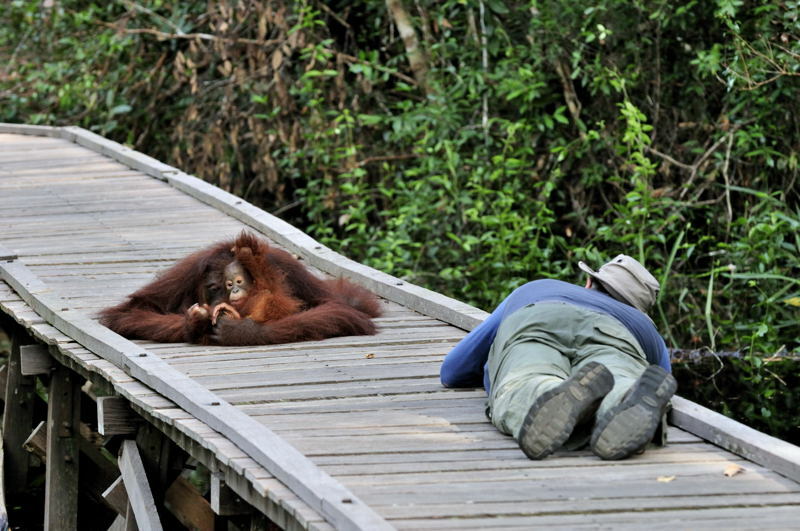 Outline Itinerary: Single centre trip to Rimba Lodge, Tanjung Puting National Park, Central Kalimantan, Borneo, Indonesia. Ground travel mainly by boat with a little walking and a short car journey between the airport and dock at either end of my stay. 2 week trip with 8 full days (9 nights) at the lodge and a fair bit of travel either side (6 flights!). Equipment: Nikon D200/MD-200, D300/MD-10, Nikkors 70-200/2.8, 70-180 micro, 300/4 AFS, 17-55/2.8, TC-14E, Kenko AF/AFS extension tubes, Wimberley WH-200, Gitzo GT3540XLS, SB-800 (+ homemade bracket), SD-8a, Nikon R1 Speedlight system, + laptop, readers, duplicate ext. hard drives, etc. After an awful lot of deliberation I elected to take the 300mm f/4 AFS in preference to the 200-400mm f/4. The logic behind this was that I was not expecting to be able to see significant distances in the forest and I reasoned that the smaller & lighter 300mm would be a better option. This, coupled with its close focus ability and maintained performance with extension tubes, made the 300mm effectively a very long pseudo macro lens too for large or distant bugs, meaning that the 300 was the best choice. 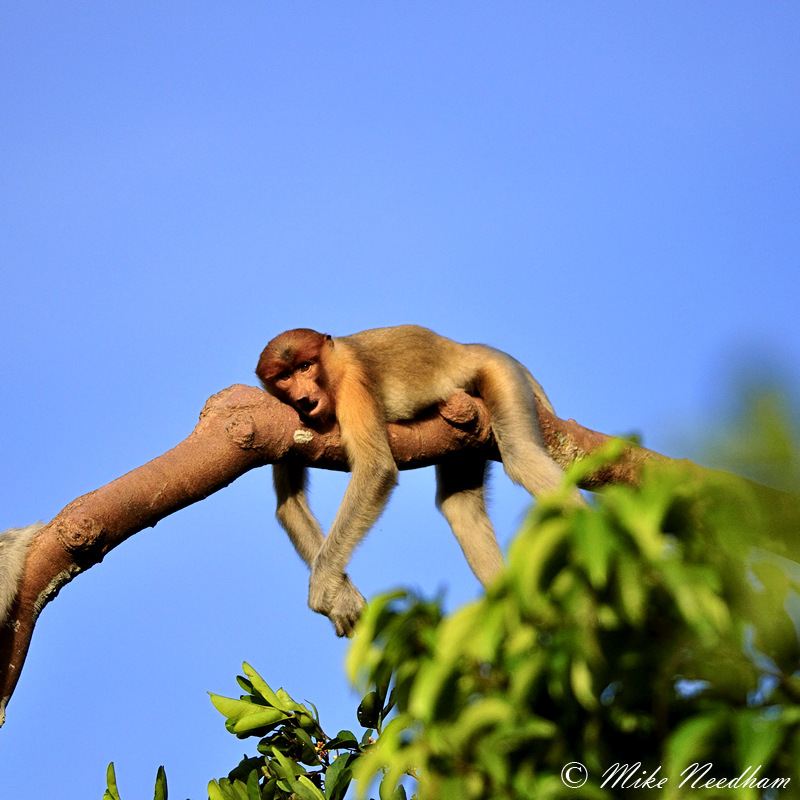 There were times when I missed the reach and VR of the 200-400mm (mainly for the proboscis monkeys shot from the deck of the boat) but overall the 300mm was the best compromise and delivered some of my favorite images from the trip. The space and weight that I saved also meant that I could comfortably take the 70-180 micro as well as the 70-200/2.8, this may seem a little extravagant but they are very definitely different horses for different courses and both were well used. The trip was very productive photographically, sure there were one or two challenges and disappointments but nothing to detract from a wonderful trip. The light levels in forest were occasionally very tricky for example, especially if combined with subject movement. Although I have to admit this was not as big an issue as I had feared it might be, particularly considering the time of year that I visited. It would however have been so helpful to have a camera that performs well at very high ISO, such as a D3s. To be able to shoot at ISO3200-6400 and still be confifdent in the quality would have greatly increased my hit rate and saved some images which were only fit for deletion. Indeed this would have been the perfect camera for the trip but you can’t have everything…. I did most of my shooting using the auto ISO function of the cameras, topping out at ISO400 on the D200 and ISO800 on the D300. These are about the limit for me, and even at these modest levels I get twitchy about quality. But in under the forest canopy there is little choice though I did make extensive use of the tripod when the opportunity arose, particularly with the 300mm and when taking close-ups. When on the tripod I would often drop the ISO back to 200 and try to time the shutter release to coincide with a point of minimal movement. Sometimes it worked, often it didn’t, but there were enough opportunities to get some great images. I also used gentle levels of fill flash on a lot of occasions, far more so that I had ever done before (or since) and primarily when on the tripod. This worked really well, especially on the gibbons, subtly filling in shadows and significantly reducing the green cast from the canopy. The homemade flash bracket was brilliant for this as it allowed me to raise the flash off axis and switch the camera between landscape and portrait at will. I also took a Kirk flash extender but did not really have need for it, it would have reduced cycle times (as less output would be needed) but the risk of the sun melting my flash through it outweighed this, and I also had the SD-8a to shorten cycle times to the point that there was no real issue most of the time. If I was to go back I would probably use fill flash far more, though any foliage in the foreground would need to be totally avoided. A little gentle fill-flash does wonders for colour casts and adding a little 'sparkle'. For me the biggest disappointment was the relatively limited amount of time available to just wonder around and look for ‘supporting cast’ subjects such as insects. I think if I were ever to return on my own I would try to have a couple of free days at the lodge to enable me to do more of this. However, unless this is something that you are particular interested in the tour was set up perfectly, full days, lots of photography and little ‘wasted time’. But for once I would have appreciated a weather day or similar, that said I could have skipped a day out looking for the orangutans but that never seemed to be a preferred option at the time. I think that key issue was that too many daylight hours were spent on the boat, typically 8 or more per day, often with little opportunity for photography. There was a feeding station only a few hundred metres from the lodge on the opposite river bank, but only once did this produce sightings so we tended to head deep into the forest to Camp Leaky where sightings were pretty much guaranteed. There was also another another location half way between the two but that was totally unproductive (except for some of my favorite bug shots). More on these sites a little later…. Small skipper-like butterfly shot at the lodge at breakfast time. D200, 300mm AFS (probably with an extension tube), f/1o 1/4 sec. Tripod. I did not go as well prepared for the macro work as I would have liked either. 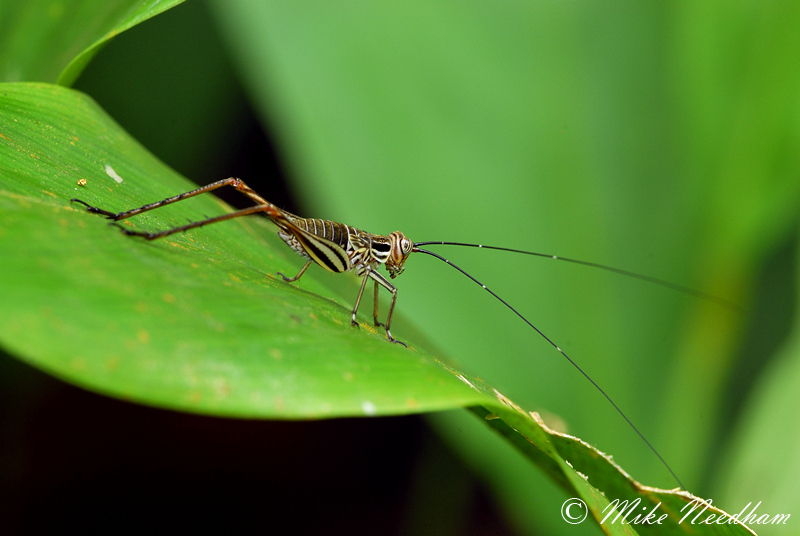 This was my first true rainforest experience; I took a macro lens, a diffuser / reflector and flash set-up and thought that would do. 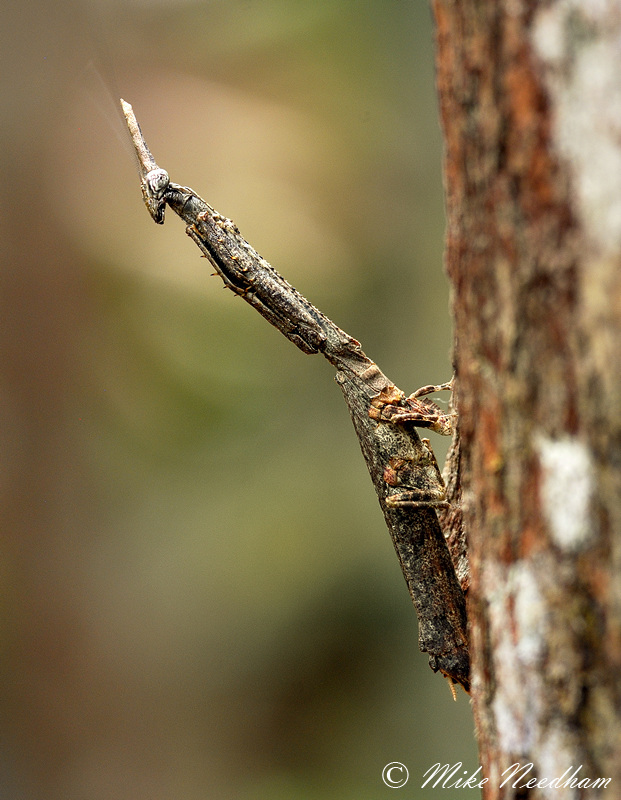 In actual fact insects were surprisingly difficult to find by day as they were generally very well camouflaged. At night though it was a very different matter, especially around the lights of the dining room at the lodge. The lights here attracted some beautiful beasties, I particularly remember one bright green cricket type insect about 5-6 cm long. Photographing it on the wall of the dining room was a little pointless and it was at this point that I realised that I should have taken some plastic lidded containers to capture and relocate such things to somewhere more photogenic. 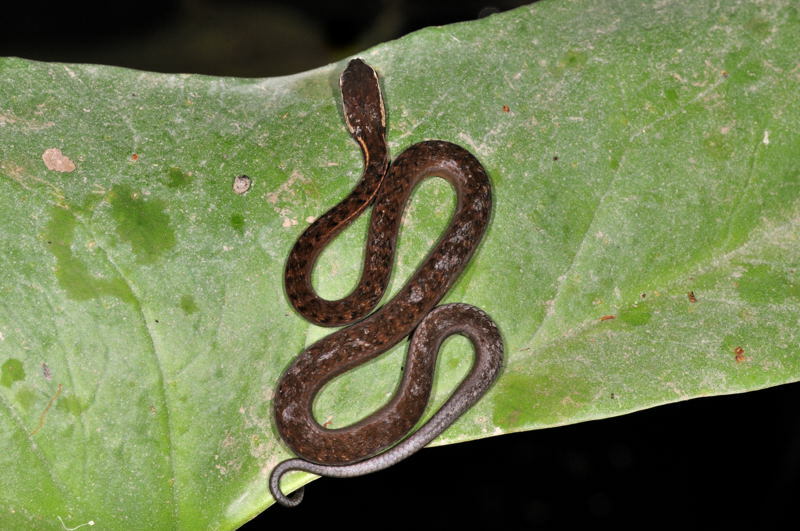 The other disappointment was how few snakes I saw, and believe me I was looking for them almost constantly. I did see one or two on the underside of the vegetation hanging over the water’s edge, but nothing that would yield a decent photograph. They were all surprisingly small too, I saw nothing more than 1 to 1½ft in length and no thicker than a power lead to a kettle. One individual that I did manage to photograph coiled on a small leaf was tiny, probably no more than 15cm and the thickness of a shoe lace. Not the best picture ever but it was early in the trip and I hoped it would be the first of many. Having said all of this about the slightly negative aspects of the insect and reptile photography what there was produced some nice images and was a lot of fun. Some of the insects that were spotted were truly amazing creatures and the combination of the 70-180mm micro and 300mm AFS (with the option to add an extension tube) were an ideal combination. Sure a 200mm micro would have been useful too (I have the manual focus AIS version) but you can’t take everything and what I did have worked extremely well. Certainly I found the flexibility of the 70-180mm more useful than the extra reach of a 200mm. A solid tripod combined with a cable release and the “mirror up” function were also required for working in natural light at close range. The 300mm was also a real treasure for these subjects especially in allowing a good reproduction ratio without having to approach too close and disturbing the subject (I had tried it out for this type of work at a butterfly house before going to Borneo and I was amazed at the quality of results when used appropriately). 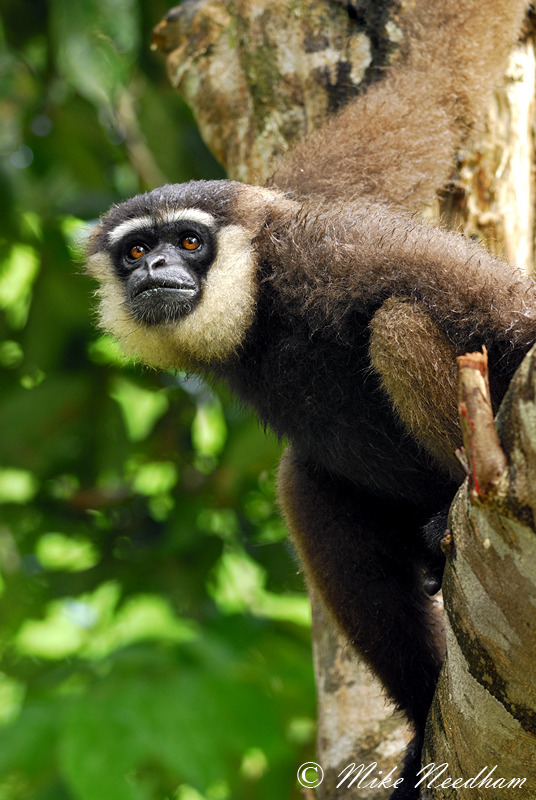 The main highlight for me were the gibbon (dark-handed or agile (Hylobates agilis)) at Camp Leaky. Before the trip I had hoped (gdreamed!) 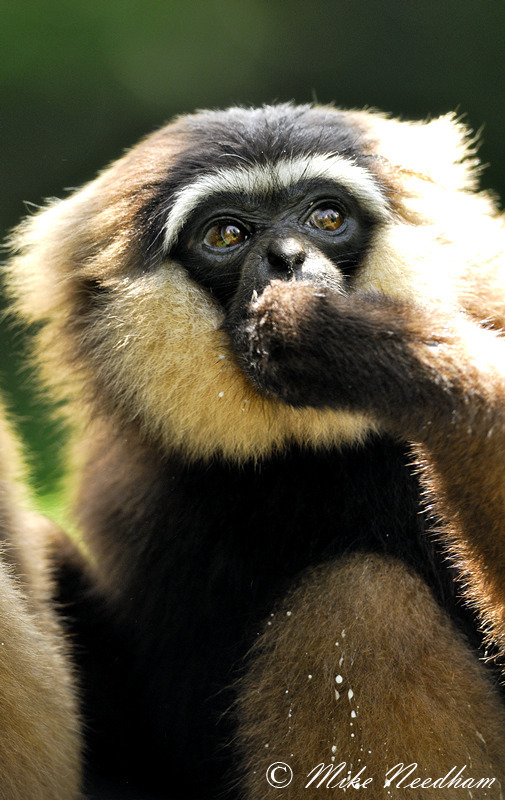 that I might see a wild gibbon but never even imagined that I would get a photograph of one, let alone a good one. But at Camp Leaky there was an adult pair with a recently weaned juvenile which, due to their regular proximity to people, were very habituated to the point that they would occasionally come down to the ground and could be approached to within a few metres. This was not particular productive photographically but it did mean that when they were in the trees around the camp they would remain relaxed and not instantly disappear. Indeed, on several occasions when trying to photograph them I would back off and shoot from far behind most of the group with the 300mm to flatten the perspective rather than shooting up at too steep an angle from right beneath them as most people seemed to do. Lighting and colour casts under the tree canopy were a real issue here and in most of the successful shots I actually used a little fill-in flash to lighten the shadows and correct the casts as discussed in more detail earlier. Some of the images obtained in this way were amongst my favorites of the whole trip and a real bonus. 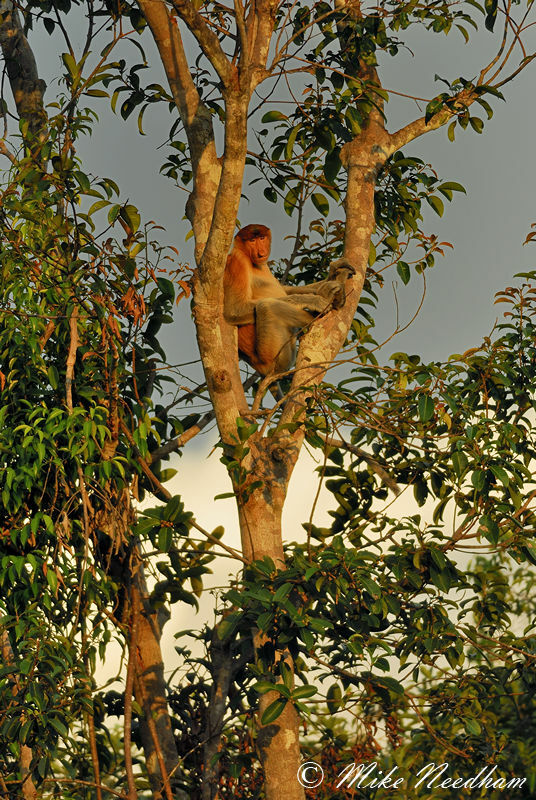 We also had several good encounters with proboscis monkeys. These were always from the boat on the main river but with a little time and patience (and skill of the boat crew) some good images could be achieved. I found the tripod invaluable in these situations to take the weight of the camera over long periods but the 300mm was often a little too short even with the crop sensor cameras. These encounters were the only times that I really missed not having the 200-400mm. Others in the group used a variety of approaches, some using a tripod as I did, whilst others would hand-hold or use a monopod. Personally I didn’t think that hand holding was a practicle option and I don’t particular like using a monopod. I did hand-hold for a while on one specific occasion (though once I had bagged some safety shots I reverted back to the tripod to maximise quality). 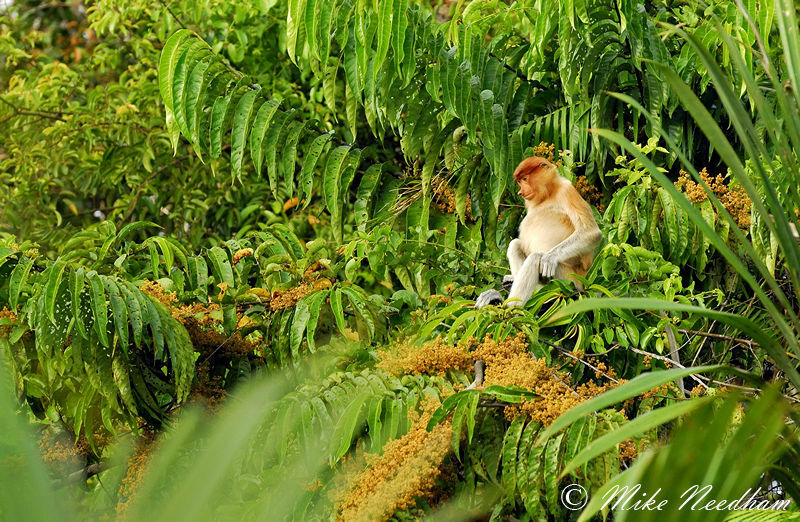 We had been heading for Camp Leaky one morning and spotted some proboscis monkeys which we were attempting to photograph. At one point the boat was pulled into a gap in the tree branches to try to get a better angle on one particular individual, my view was not great so I was looking around for anything else that may provide an opportunity when I spotted something unusual on a tree trunk not more than 4 or 5 metres away. It was clearly not part of the tree but its camouflage and unusual ‘V’ shape made it very hard to make out in the shadows, even from such close range. It was about 25-30cm high and so not particularly small either. My first thought was that it was perhaps a bird but I decided to get a few record shots of it before asking the guide. Through the viewfinder it looked even more unusual, it was mottled in predominantly green and yellow and had dark red eyes. 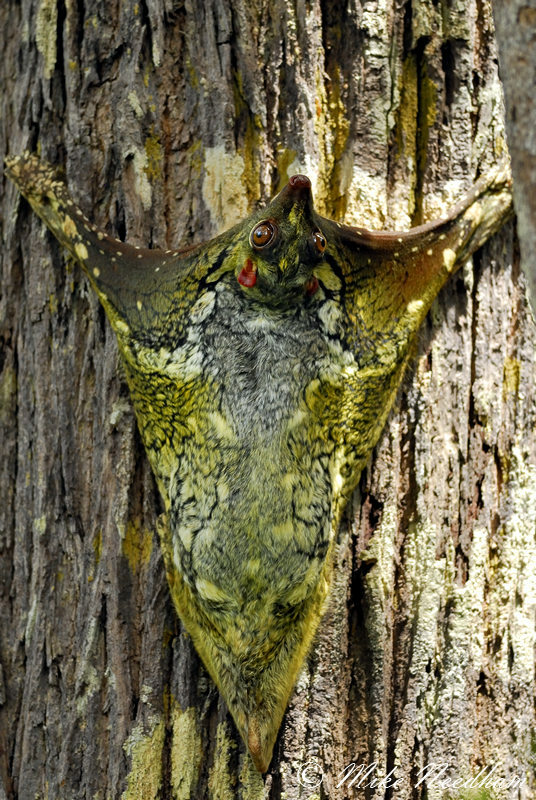 With a few frames ‘in the can‘ I pointed it out and found out that it was actually a flying lemur or Malayan colugo. Obviously it was not a true lemur, nor do they actually fly, but they are amongst the best adapted mammals in the world (excluding bats) for gliding. As we got a little closer it was clearly a mammal of some description but as it was relying on its camouflage and not moving it was very hard to identify. I (and the rest of the group) lost all interest in the monkeys at this point and spent the next 20-30 minutes photographing this beautiful creature with various lens and from a variety of angles before if scampered higher into the canopy and out of view. The guide subsequently told us that in all of the time he had spent in the forest he had never had such a close and clear encounter with one. It was a truly beautiful creature and another bonus. This trip was a little atypical for me in that I had booked it only 2-3 months before departure and had done very little advance research, which after my experience in Kruger back in 2003 is something I am very mindful to avoid . But sometimes circumstances dictate that you have to do things differently to how you would ideally like to. I had seen this trip some time earlier but I had decided to do a tiger trip in 2009 in preference to it, and as I generally ‘only’ do one trip per year it was on my mental list of ‘possibles’ for next time but had given it no further thought. My wife and I had been planning a trip to some still to be identified location late in 2009 but had not booked anything. Then in Q3 my wife started a new job and after a few weeks decided that she would prefer not to go away so soon so that she could get fully established in her new role. So, the year end was fast approaching and I had 2 weeks of leave to take by the end of December. Taking extra time at Christmas was an obvious, if somewhat depressing, option so my wife suggested that I look for another photo trip (I knew I married for a good reason!). Once I was certain that I was not hallucinating this conversation I did some checks on this trip and within 2 to 3 days it was booked whilst there was still space. The beauty of having been with Photographers on Safari before was that I knew that John would have done a recci trip and would give me an honest appraisal of the trip’s potential, so I called him. It all hung together other than the fact that John had indeed been on a scouting trip but that this had been at a different time of year. In addition the monsoon season runs November to January and so we would be right in the middle of it! I had visions of wall to wall rain for 2 weeks so John suggested I spoke with his agents who were organizing the trip logistics. The message from them was that there had been a definite trend in the previous few years of a lull in the rain during December and that even so it only tended to rain in the afternoons for a couple of hours and / or overnight. I was short of both time and options and so decided to take the plunge (hopefully not literally). And so, seemingly within a blink of an eye, I was heading for borneo. 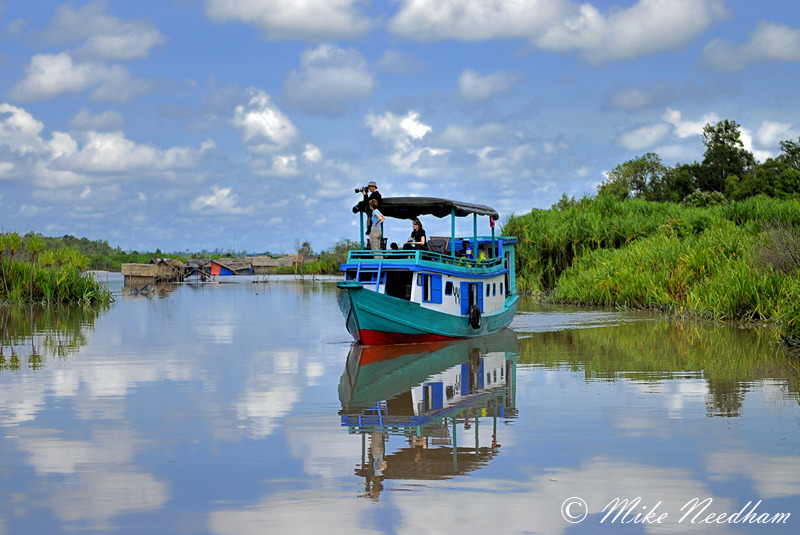 It was a long journey to get there but I was filled with excited anticipation at the prospect of seeing the orangutans in their natural environment. The trip presented some great opportunities and experiences, not all of which were photographic. Whilst walking to the feeding station at Camp Leaky a mother orangutan (I believe the guide said that she was called “Princess” although personally I do not like such anthropomorphism) came up to our party, gently grabbed two people by the hand, and started to walk upright with them using her new found friends to support her. When these ‘supporters’ started to tire she would solicit the help of two more, and so it continued until our destination was reached. 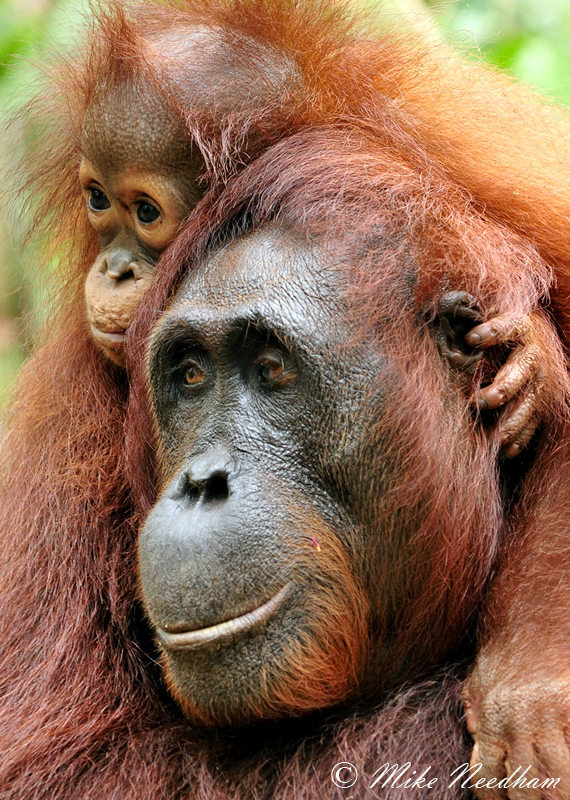 You can take it from me that the orangutan is a deceptively heavy creature and the term ‘vice like grip’ is overkill unless you are being held by an orangutan. Her grip was never so tight as to be painful but a surer grip I cannot imagine. There was no way you would be able to extricate yourself from it without her cooperation. Later during that afternoon a few spots of rain started to fall and seemingly within seconds it was like being under a waterfall. 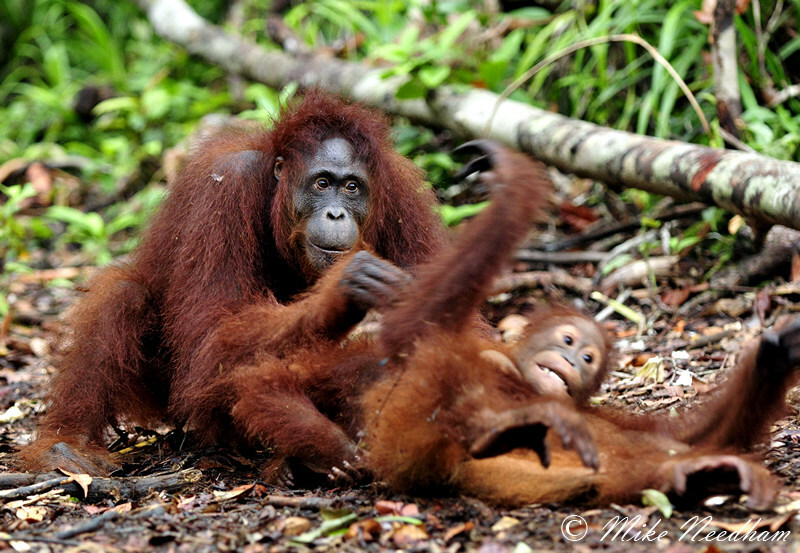 At this point the same female orangutan we had earlier walked with raced (I did not realise that they could move so quickly) across the forest floor, with her baby clinging on, straight towards two of the ladies in our party sat on a fallen tree trunk sheltering under their ponchos. On reaching them she lifted the front of one of the ponchos, shot under, and pulled it back down behind her. It happened so quickly and left no sign of her that I wondered if I had actually imagined it. 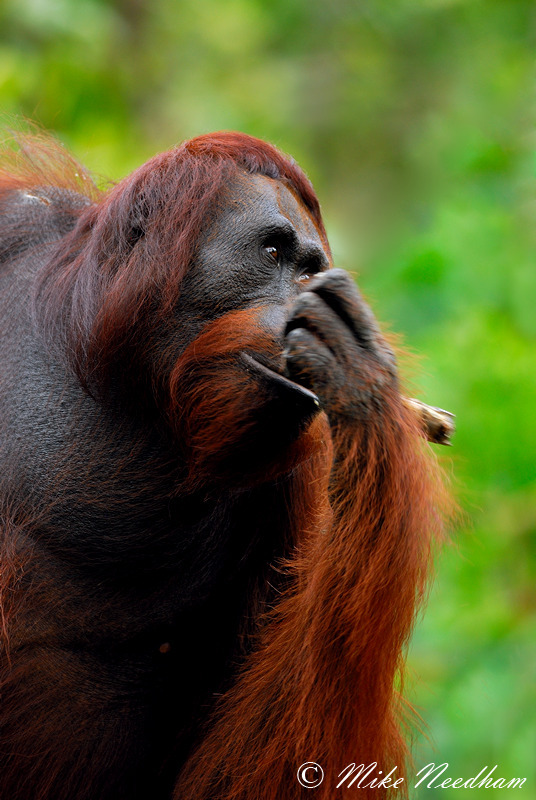 Only the looks of disbelief on everyone’s faces, especially the owner of the poncho, confirmed that there were indeed two orangutans under the poncho hiding from the rain. As I hurriedly made sure that all of my gear was safely packed away and protected from the rain one of the other party members moved to gently lift the front of the poncho to take a picture. 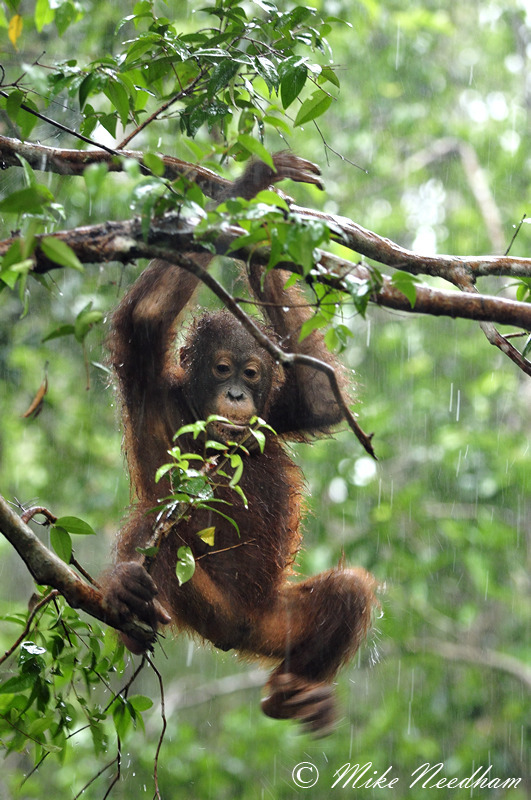 The mother orangutan was having none of it; she grabbed it and pulled in back down to keep out the rain. 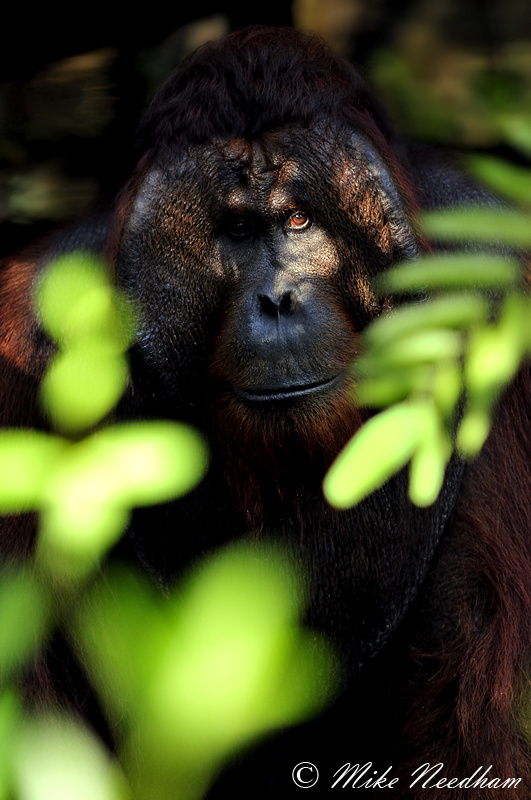 It was clear that our shoot was over for the day and so the guide gestured for us to start heading back to the boat, but what about the sheltering orangutan. Well, believe it or not (I saw it and I am still flabbergasted by it), the guide had to bribe the orangutan with an umbrella so that she would release the poncho and its owner. We left in the pouring rain, behind us on the track a mother and baby orangutan huddled under a pink and purple umbrella. A poor trade if you ask me, the rain would strike the umbrellas so hard as to force some of the water through the fibres of the fabric such that the owners head was in a constant mist spray. It really is hard to explain to anyone who has not actually experienced such a downpour just how heavy the rain is in these regions of the world. The dry dust path we had earlier walked up was a 10ft wide, 8 inch deep torrent within seconds of the rain starting. Suspecting it was going to rain I had packed my cameras away before it started and only needed to put an extra waterproof layer over my bag as it started, despite this the next day my camera had water droplets inside of the viewfinder! Thankfully a few hours in the sun dried it out with no issues (testament to the ruggedness of Nikon cameras despite all of the delicate electronics – I am still using the same camera 2½ years and tens of thousands of pictures later). It actually rained much less during the trip than I had expected, indeed to have the amount of rain I saw during this trip at any time of year in a rainforest environment I would consider myself fortunate. It did not even rain every day but when it did it was generally in the afternoon and lasted for about 1-2 hours. When it finished things (other than you!) quickly dried out. I don’t want to give the wrong impression here as to the nature of this forest and the orangutan population within it. Make no mistake; these animals are not pets, exhibits or trained circus animals. They live wild but as many, if not most, have been either hand reared or brought-up by their hand reared mothers, many are habituated and comfortable around humans. Some, like the mother described above, are particularly so. Reading subsequent to the trip I believe that newly hand reared orangutans have not been released into this area for some years (not since around 1996) so as to not over populate it, so all of these animals have been living ‘wild’ for some time. 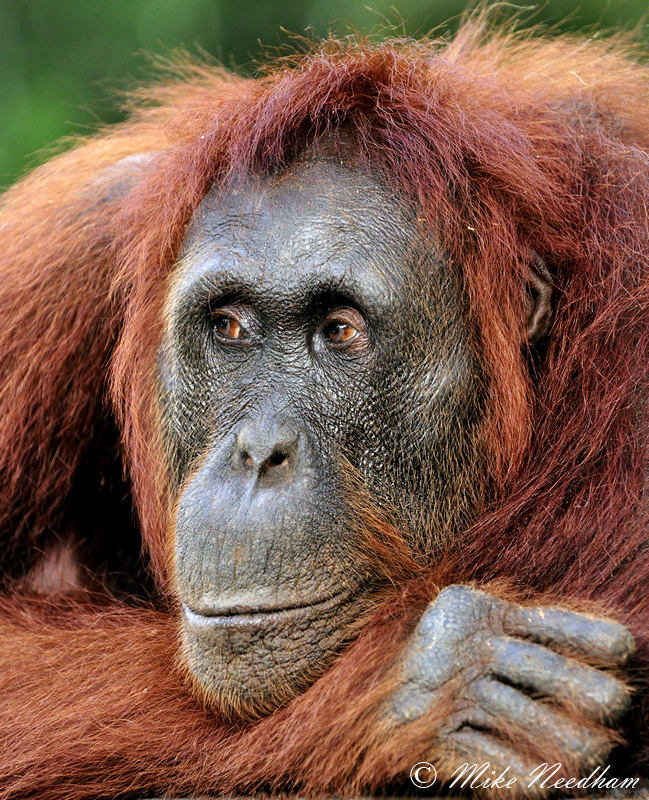 Others, such as Tom the large dominant male in the area, are fully wild and have never had human care. 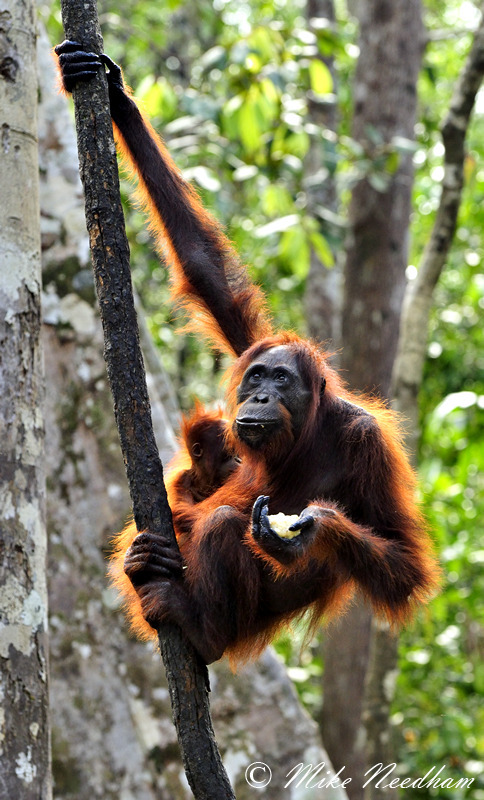 Some of the outings we did to various feeding stations resulted in no orangutan sighting at all, the reason for this was apparently because there was an abundance of natural food in the forest at this time of year and so the orangutans were less likely to visit the feeding stations. 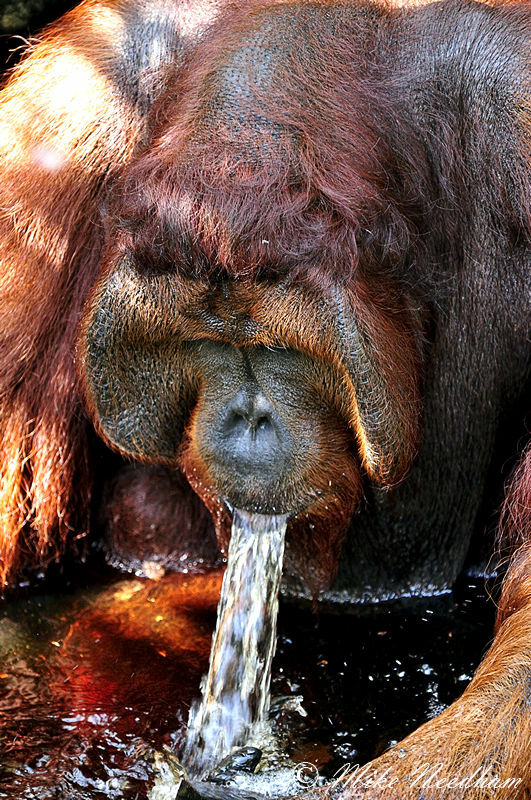 The monsoons trigger a proliferation of fungi fruiting bodies which the orangutans relish and seek out. We visited 3 different feeding stations during the trip. 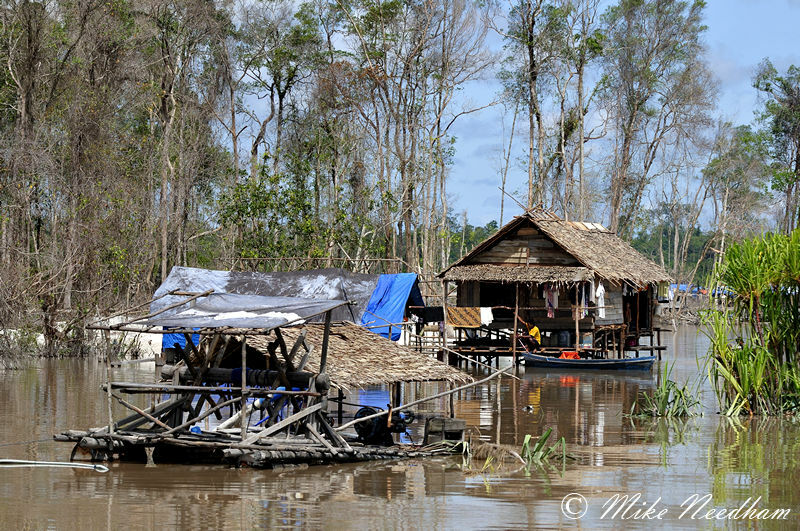 Most time was spent around Camp Leaky which proved to be by far the most productive, but was about 4 hours up river (Sekonyer River) from Rimba Lodge by (slow) boat. 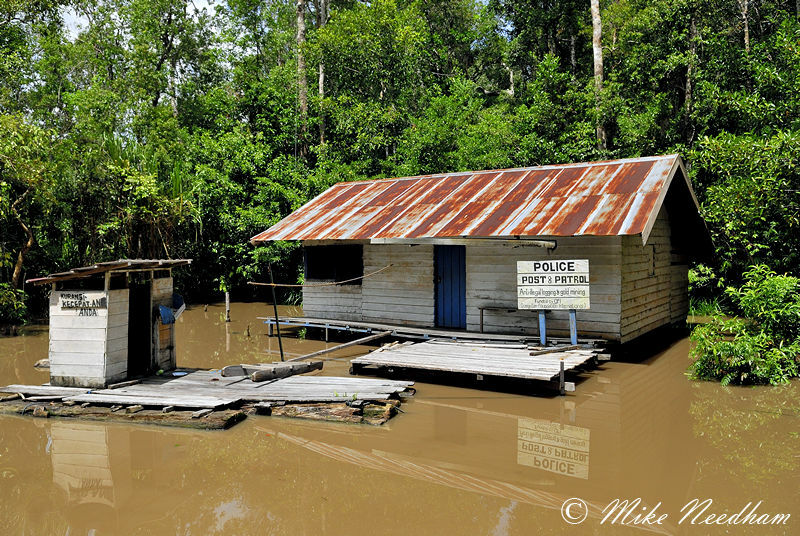 On the way to Camp Leaky we stopped off a couple of times at Pondok Tanggui but on both occasions we drew a blank on orangutans. 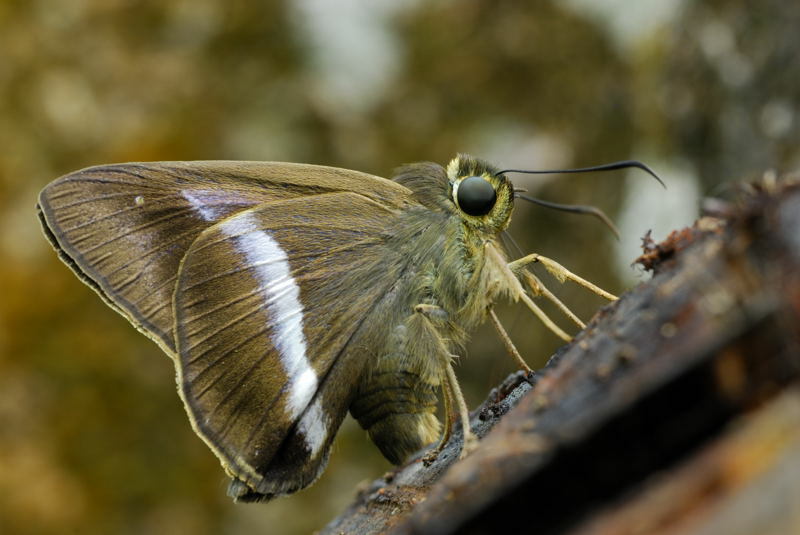 Despite the lack of orange primates I still enjoyed the time there as the decaying fruit and sugar cane (the orangutans had clearly not been there for at least a few days) attracted various butterflies and the like. Also this ‘spare time’ gave the opportunity to look for, and photograph, some of the amazing and exotic bugs in the forest. The third feeding station visited was at Tanjung Harapan was just a few hundred metres down river and on the opposite bank to Rimba Lodge. This was clearly very convenient and negated the need for several hours on the boat. It was a much smaller site than Camp Leaky and had much denser vegetation but sadly was unreliable. 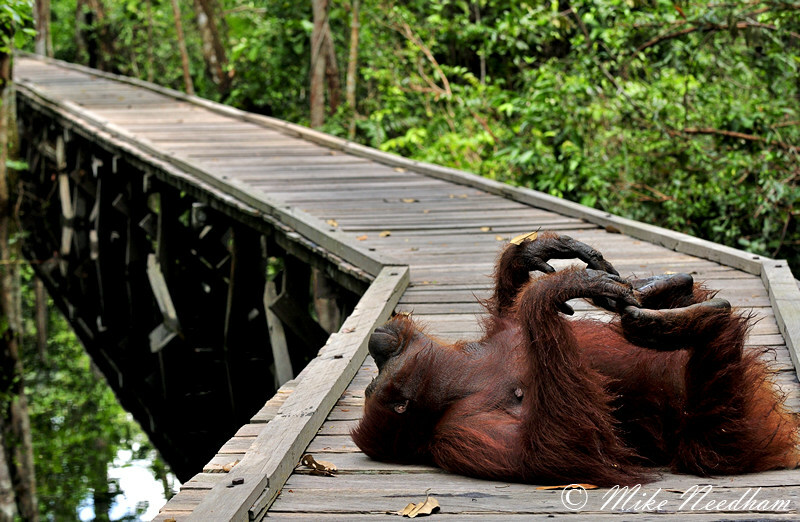 The first visit produced several orangutans, and some of my favorite images, but the second drew a total blank. Camp Leaky in comparison always seemed to produce, offered the possibility of other subjects during the journey each way and there was a habituated family of gibbons occasionally around the actual ‘camp’ area. The latter reason in particular always made the journey there well worth the time for me. The productivity of the actual journeys on the river was actually quite low, and for me personally time around the lodge or just in a patch of forest looking for bugs would probably been far more productive. 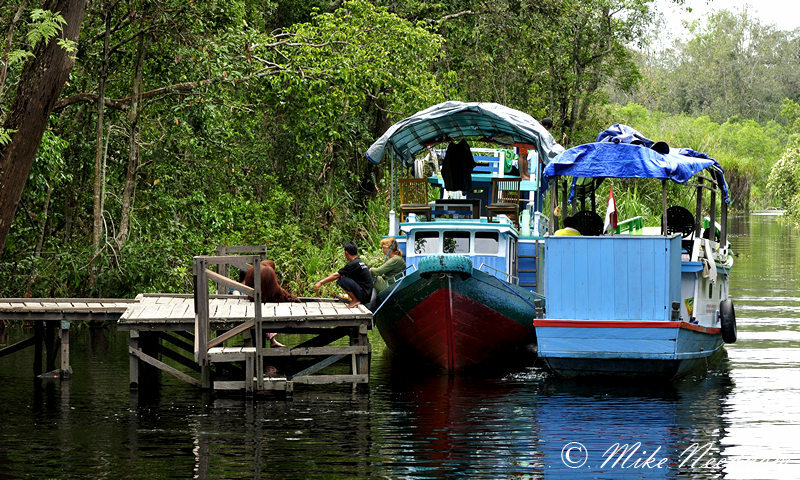 But the boats were a means to an end and the time on the river was both relaxing and occasionally produced good sighting of proboscis monkeys in particular. Camp Leaky itself, and in particular the boardwalk leading to it from the landing jetty, was quite open and had reasonable numbers of ‘lesser’ subjects such as insects and pitcher plants should you take the time to look for them, all of which added to the experience and diversity of subject matter. All in it was a very productive and enjoyable trip and certainly something I would happily do again (especially if there were not so many other places I have still to visit and discover).